Perennial; culms solitary. Rhizomes elongated. Culms 30-80 cm long; swollen at the base; forming an ovoid corm. Leaf-sheaths tubular for much of their length; with 0.9-1 of their length closed; scaberulous. Ligule an eciliate membrane; 1-3 mm long; glabrous on abaxial surface; erose, or lacerate. Leaf-blades flat, or involute; 2-4 mm wide. Leaf-blade surface glabrous to pubescent. Inflorescence a panicle. Panicle open; linear; 7-15 cm long. Primary panicle branches appressed. Spikelets solitary. Fertile spikelets pedicelled. Pedicels filiform; flexuous. Spikelets comprising 3-8 fertile florets; with diminished florets at the apex. Spikelets ovate; laterally compressed; 9-15 mm long; breaking up at maturity; disarticulating below each fertile floret. Rhachilla internodes terete; 1.5-2 mm long. 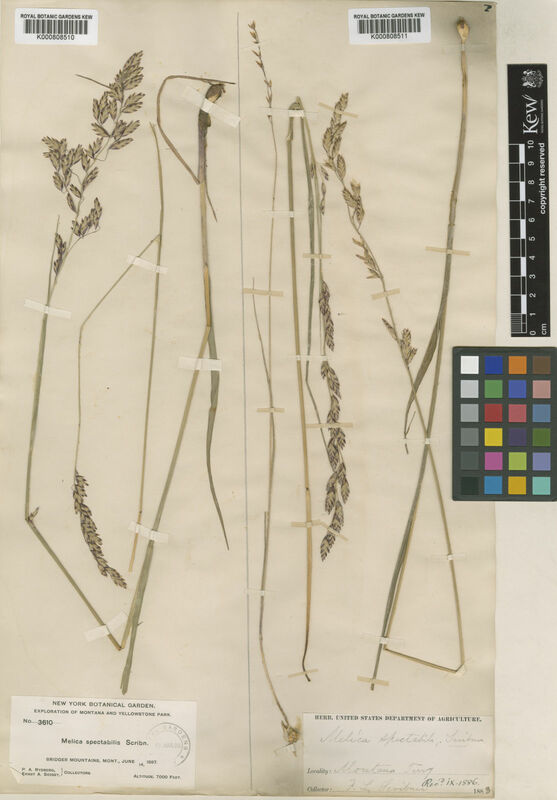 Glumes persistent; similar; shorter than spikelet; thinner than fertile lemma. Lower glume oblong; 4-6 mm long; 0.75 length of upper glume; membranous; much thinner above; much thinner on margins; without keels; 3(-5) -veined. Lower glume lateral veins prominent. Lower glume apex acute. Upper glume oblong; 6-7 mm long; 0.9-1 length of adjacent fertile lemma; membranous; much thinner above; with hyaline margins; without keels; 5(-7) -veined. Upper glume apex acute. Fertile lemma ovate; 6-8 mm long; chartaceous; much thinner on margins; without keel; 7-11 -veined. Lemma lateral veins distinct. Lemma apex obtuse. Palea 2 -veined. Apical sterile florets barren; in a clump; ovate; 2.5 mm long. Lodicules 2; united; oblong; fleshy; truncate. Anthers 3; 2-2.5 mm long. North America: western Canada, northwest USA, and southwest USA. Meliceae. Fl Pac NW 1994.